For small streams and creeks: Redington 8 ft. 4 piece CPX with and Abel TR2 and a Marryat 7.5. For dry fly fishing: Sage ONE 496-4 with Abel TR2 reels with Golden trout and Brook trout finishes. 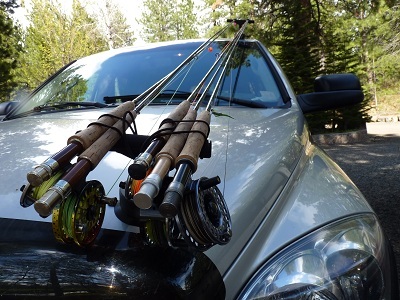 For nymphing: Orvis 10 ft 4 weights with Redington Rise reels. For dredging: A Sage XP 590-2 and a Sage VXP 590-4 with Ross Vexsis 1.5 reel and Ross Evolution 1.5 reel. For dredging: Orvis Helios 790-4, Orvis 790-4 Hydros, Sea Level Stealth 790-4 with Redington Rise reels and Abel Super 7 and Super 8 with Bonefish and striper finish. 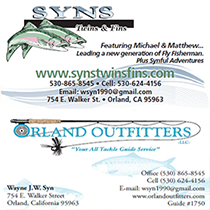 For topwater: Orvis Helios 990-4, Sage Xi3 990-4 with Abel #4N and Tibor Everglades reels. 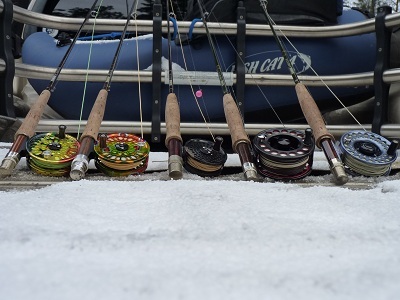 Intermediate line striper: Orvis Helios 890-4, Red Truck Diesel 890-4, G Loomis CrossCurrent 890-4 with Redington Rise and Sage D series and Tibor Back Country Light reels. FLY LINES are Rio and SA. Conventional tackle includes: Shimano Curados, Calcutta 150’s, Saharas. 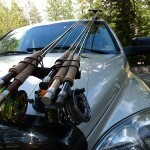 Pfleuger Presidents, Berkeley casting and spinning rods. 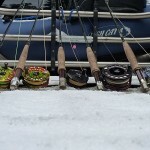 DISCLAIMER: RODS AND REELS MAY VARY depending on our inventory and fishing conditions.